"Knighthood" redirects here. For other uses, see knight (disambiguation) and knights (disambiguation). Historically, in Europe, knighthood was conferred upon mounted warriors. During the High Middle Ages, knighthood was considered a class of lower nobility. By the Late Middle Ages, the rank had become associated with the ideals of chivalry, a code of conduct for the perfect courtly Christian warrior. 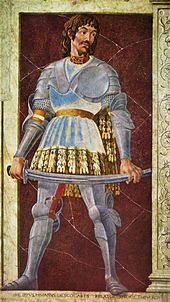 Often, a knight was a vassal who served as an elite fighter, a bodyguard or a mercenary for a lord, with payment in the form of land holdings. 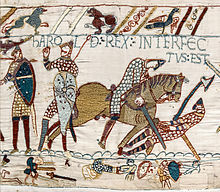 The lords trusted the knights, who were skilled in battle on horseback. Knighthood in the Middle Ages was closely linked with horsemanship (and especially the joust) from its origins in the 12th century until its final flowering as a fashion among the high nobility in the Duchy of Burgundy in the 15th century. This linkage is reflected in the etymology of chivalry, cavalier and related terms. The special prestige accorded to mounted warriors in Christendom finds a parallel in the furusiyya in the Muslim world, and the Greek hippeis (ἱππεῖς) and Roman eques of classical antiquity. In the late medieval period, new methods of warfare began to render classical knights in armour obsolete, but the titles remained in many nations. 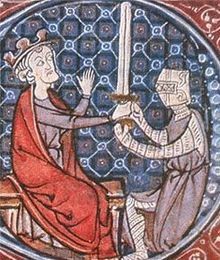 The ideals of chivalry were popularized in medieval literature, particularly the literary cycles known as the Matter of France, relating to the legendary companions of Charlemagne and his men-at-arms, the paladins, and the Matter of Britain, relating to the legend of King Arthur and his Round Table. Today, a number of orders of knighthood continue to exist in Christian Churches, as well as in several historically Christian countries and their former territories, such as the Roman Catholic Order of the Holy Sepulchre and Order of Malta, the Protestant Order of Saint John, as well as the English Order of the Garter, the Swedish Royal Order of the Seraphim, and the Royal Norwegian Order of St. Olav. Each of these orders has its own criteria for eligibility, but knighthood is generally granted by a head of state, monarch, or prelate to selected persons to recognise some meritorious achievement, as in the British honours system, often for service to the Church or country. The modern female equivalent in the United Kingdom is Dame. The word knight, from Old English cniht ("boy" or "servant"), is a cognate of the German word Knecht ("servant, bondsman, vassal"). This meaning, of unknown origin, is common among West Germanic languages (cf Old Frisian kniucht, Dutch knecht, Danish knægt, Swedish knekt, Norwegian knekt, Middle High German kneht, all meaning "boy, youth, lad"). 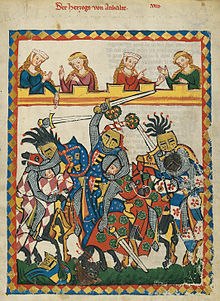 Middle High German had the phrase guoter kneht, which also meant knight; but this meaning was in decline by about 1200. A rādcniht, "riding-servant", was a servant on horseback. These mobile mounted warriors made Charlemagne's far-flung conquests possible, and to secure their service he rewarded them with grants of land called benefices. These were given to the captains directly by the Emperor to reward their efforts in the conquests, and they in turn were to grant benefices to their warrior contingents, who were a mix of free and unfree men. In the century or so following Charlemagne's death, his newly empowered warrior class grew stronger still, and Charles the Bald declared their fiefs to be hereditary. The period of chaos in the 9th and 10th centuries, between the fall of the Carolingian central authority and the rise of separate Western and Eastern Frankish kingdoms (later to become France and Germany respectively) only entrenched this newly landed warrior class. This was because governing power and defense against Viking, Magyar and Saracen attack became an essentially local affair which revolved around these new hereditary local lords and their demesnes. When the boy turned 15, he became a squire. In a religious ceremony, the new squire swore on a sword consecrated by a bishop or priest, and attended to assigned duties in his lord's household. During this time the squires continued training in combat and were allowed to own armour (rather than borrowing it). The accolade or knighting ceremony was usually held during one of the great feasts or holidays, like Christmas or Easter, and sometimes at the wedding of a noble or royal. The knighting ceremony usually involved a ritual bath on the eve of the ceremony and a prayer vigil during the night. On the day of the ceremony, the would-be knight would swear an oath and the master of the ceremony would dub the new knight on the shoulders with a sword. Squires, and even soldiers, could also be conferred direct knighthood early if they showed valor and efficiency for their service; such acts may include deploying for an important quest or mission, or protecting a high diplomat or a royal relative in battle. 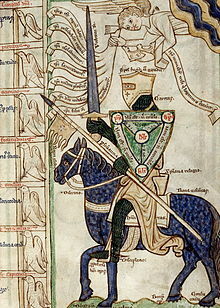 The miles Christianus allegory (mid-13th century), showing a knight armed with virtues and facing the vices in mortal combat. The parts of his armour are identified with Christian virtues, thus correlating essential military equipment with the religious values of chivalry: The helmet is spes futuri gaudii (hope of future bliss), the shield (here the shield of the Trinity) is fides (faith), the armour is caritas (charity), the lance is perseverantia (perseverance), the sword is verbum Dei (the word of God), the banner is regni celestis desiderium (desire for the kingdom of heaven), the horse is bona voluntas (good will), the saddle is Christiana religio (Christian religion), the saddlecloth is humilitas (humility), the reins are discretio (discretion), the spurs are disciplina (discipline), the stirrups are propositum boni operis (proposition of good work), and the horse's four hooves are delectatio, consensus, bonum opus, consuetudo (delight, consent, good work, and exercise). In peacetime, knights often demonstrated their martial skills in tournaments, which usually took place on the grounds of a castle. 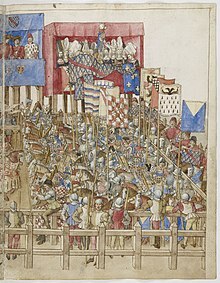 Knights can parade their armour and banner to the whole court as the tournament commenced. Medieval tournaments were made up of martial sports called hastiludes, and were not only a major spectator sport but also played as a real combat simulation. It usually ended with many knights either injured or even killed. 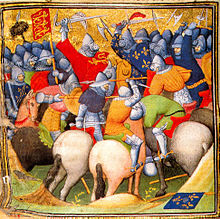 One contest was a free-for-all battle called a melee, where large groups of knights numbering hundreds assembled and fought one another, and the last knight standing was the winner. The most popular and romanticized contest for knights was the joust. In this competition, two knights charge each other with blunt wooden lances in an effort to break their lance on the opponent's head or body or unhorse them completely. The loser in these tournaments had to turn his armour and horse over to the victor. The last day was filled with feasting, dancing and minstrel singing. Besides formal tournaments, they were also unformalized judicial duels done by knights and squires to end various disputes. Countries like Germany, Britain and Ireland practiced this tradition. Judicial combat was of two forms in medieval society, the feat of arms and chivalric combat. The feat of arms were done to settle hostilities between two large parties and supervised by a judge. 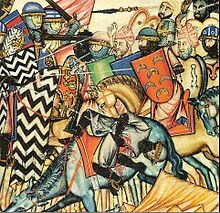 The chivalric combat was fought when one party's honor was disrespected or challenged and the conflict could not be resolved in court. Weapons were standardized and must be of the same caliber. The duel lasted until the other party was too weak to fight back and in early cases, the defeated party were then subsequently executed. 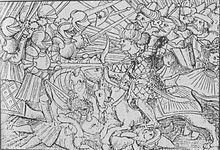 Examples of these brutal duels were the judicial combat known as the Combat of the Thirty in 1351, and the trial by combat fought by Jean de Carrouges in 1386. A far more chivalric duel which became popular in the Late Middle Ages was the pas d'armes or "passage of arms". In this hastilude, a knight or a group of knights would claim a bridge, lane or city gate, and challenge other passing knights to fight or be disgraced. If a lady passed unescorted, she would leave behind a glove or scarf, to be rescued and returned to her by a future knight who passed that way. The Battle of Pavia in 1525. Landsknecht mercenaries with arquebus. By the end of the 15th century, knights were becoming obsolete as countries started creating their own professional armies that were quicker to train, cheaper and easier to mobilize. The advancement of high-powered firearms eradicated the use of plate armour, as the time it took to train soldiers with guns was much less compared to that of the knight. The cost of equipment was also significantly lower, and guns had a reasonable chance to easily penetrate a knight's armour. 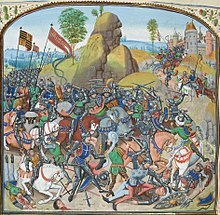 In the 14th century the use of infantrymen armed with pikes and fighting in close formation also proved effective against heavy cavalry, such as during the Battle of Nancy, when Charles the Bold and his armoured cavalry were decimated by Swiss pikemen. As the feudal system came to an end, lords saw no further use of knights. Many landowners found the duties of knighthood too expensive and so contented themselves with the use of squires. Mercenaries also became an economic alternative to knights when conflicts arose. Armies of the time started adopting a more realistic approach to warfare than the honor-bound code of chivalry. Soon, the remaining knights were absorbed into professional armies. Although they had a higher rank than most soldiers because of their valuable lineage, they lost their distinctive identity that previously set them apart from common soldiers. As the age of knights dissolved, some still survived as knightly orders who still exist even by the end of the Medieval Age. They adopted newer technology while still retaining their age-old chivalric traditions. Examples of holy orders that existed beyond the Middle Ages were the Knights Hospitaller and Teutonic Knights. 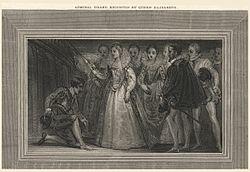 Francis Drake (left) being knighted by Queen Elizabeth I in 1581. The recipient is tapped on each shoulder with a sword. Some European countries, such as The Netherlands, Belgium and Spain among others (see below). In Belgium, honorific knighthood (not hereditary) can be conferred by the King on particularly meritorious individuals such as scientists or eminent businessmen, or for instance to astronaut Frank De Winne, the second Belgian in space. This practice is similar to the conferral of the dignity of Knight Bachelor in the United Kingdom. In addition, there still are a number of hereditary knights in Belgium (see below). In the Polish–Lithuanian Commonwealth the monarchs tried to establish chivalric orders but the hereditary lords who controlled the Union did not agree and managed to ban such assemblies. They feared the King would use Orders to gain support for absolutist goals and to make formal distinctions among the peerage which could lead to its legal breakup into two separate classes, and that the King would later play one against the other and eventually limit the legal privileges of hereditary nobility. But finally in 1705 King August II managed to establish the Order of the White Eagle which remains Poland's most prestigious order of that kind. The head of state (now the President as the acting Grand Master) confers knighthoods of the Order to distinguished citizens, foreign monarchs and other heads of state. The Order has its Chapter. There were no particular honorifics that would accompany a knight's name as historically all (or at least by far most) of its members would be royals or hereditary lords anyway. So today, a knight is simply referred to as "Name Surname, knight of the White Eagle (Order)". In the Kingdom of Spain, the Royal House of Spain grants titles of knighthood to the successor of the throne. This knighthood title known as Order of the Golden Fleece is among the most prestigious and exclusive Chivalric Orders. This Order can also be granted to persons not belonging to the Spanish Crown, as the current Emperor of Japan Akihito, the current Queen of United Kingdom Elizabeth II or the important Spanish politician of the Spanish democratic transition Adolfo Suárez, among others. There are traces of the Continental system of hereditary knighthood in Ireland. Notably all three of the following belong to the Hiberno-Norman FitzGerald dynasty, created by the Earls of Desmond, acting as Earls Palatine, for their kinsmen. Another Irish family were the O'Shaughnessys, who were created knights in 1553 under the policy of surrender and regrant (first established by Henry VIII of England). They were attainted in 1697 for participation on the Jacobite side in the Williamite wars. Women were appointed to the Order of the Garter almost from the start. In all, 68 women were appointed between 1358 and 1488, including all consorts. Though many were women of royal blood, or wives of knights of the Garter, some women were neither. They wore the garter on the left arm, and some are shown on their tombstones with this arrangement. After 1488, no other appointments of women are known, although it is said that the Garter was conferred upon Neapolitan poet Laura Bacio Terricina, by King Edward VI. In 1638, a proposal was made to revive the use of robes for the wives of knights in ceremonies, but this did not occur. Queens consort have been made Ladies of the Garter since 1901 (Queens Alexandra in 1901, Mary in 1910 and Elizabeth in 1937). The first non-royal woman to be made Lady Companion of the Garter was The Duchess of Norfolk in 1990, the second was The Baroness Thatcher in 1995 (post-nominal: LG). On 30 November 1996, Lady Fraser was made Lady of the Thistle, the first non-royal woman (post-nominal: LT). (See Edmund Fellowes, Knights of the Garter, 1939; and Beltz: Memorials of the Order of the Garter). The first woman to be granted a knighthood in modern Britain seems to have been H.H. Nawab Sikandar Begum Sahiba, Nawab Begum of Bhopal, who became a Knight Grand Commander of the Order of the Star of India (GCSI) in 1861, at the foundation of the order. Her daughter received the same honor in 1872, as well as her granddaughter in 1910. The order was open to "princes and chiefs" without distinction of gender. The first European woman to have been granted an order of knighthood was Queen Mary, when she was made a Knight Grand Commander of the same order, by special statute, in celebration of the Delhi Durbar of 1911. She was also granted a damehood in 1917 as a Dame Grand Cross, when the Order of the British Empire was created (it was the first order explicitly open to women). The Royal Victorian Order was opened to women in 1936, and the Orders of the Bath and Saint Michael and Saint George in 1965 and 1971 respectively. As related in Orders of Knighthood, Awards and the Holy See by H. E. Cardinale (1983), the Order of the Blessed Virgin Mary was founded by two Bolognese nobles Loderingo degli Andalò and Catalano di Guido in 1233, and approved by Pope Alexander IV in 1261. It was the first religious order of knighthood to grant the rank of militissa to women. However, this order was suppressed by Sixtus V in 1558. ^ Almarez, Felix D. (1999). Knight Without Armor: Carlos Eduardo Castañeda, 1896-1958. Texas A&M University Press. p. 202. ISBN 9781603447140. ^ Diocese of Uyo. El-Felys Creations. 2000. p. 205. ISBN 9789783565005. ^ Carnine, Douglas; et al. (2006). World History:Medieval and Early Modern Times. USA: McDougal Littell. pp. 300–301. ISBN 978-0-618-27747-6. Knights were often vassals, or lesser nobles, who fought on behalf of lords in return for land. ^ Paddock, David Edge & John Miles (1995). Arms & armor of the medieval knight : an illustrated history of weaponry in the Middle Ages (Reprinted. ed.). New York: Crescent Books. p. 3. ISBN 0-517-10319-2. ^ a b "Knight". Online Etymology Dictionary. Retrieved 2009-04-07. ^ Clark Hall, John R. (1916). A Concise Anglo-Saxon Dictionary. Macmillan Company. p. 238. Retrieved 18 January 2019. ^ "Equestrian". The American Heritage Dictionary of the English Language, 4th ed. Houghton Mifflin Company. 2000. ^ "Cavalier". The American Heritage Dictionary of the English Language, 4th ed. Houghton Mifflin Company. 2000. ^ "Reidh- [Appendix I: Indo-European Roots]". The American Heritage Dictionary of the English Language, 4th ed. Houghton Mifflin Company. 2000. ^ Church, Stephen (1995). Papers from the sixth Strawberry Hill Conference 1994. Woodbridge, England: Boydell. p. 51. ISBN 978-0-85115-628-6. ^ a b Nelson, Ken (2015). "Middle Ages: History of the Medieval Knight". Ducksters. Technological Solutions, Inc. (TSI). ^ a b Saul, Nigel (September 6, 2011). "Knighthood As It Was, Not As We Wish It Were". Origins. ^ Craig Freudenrich, Ph.D. "How Knights Work". How Stuff Works. January 22, 2008. ^ "The Knight in Armour: 8th–14th century". History World. ^ Bumke, Joachim (1991). Courtly Culture: Literature and Society in the High Middle Ages. Berkeley, US and Los Angeles, US: University of California Press. pp. 231–233. ISBN 9780520066342. ^ a b Hermes, Nizar (December 4, 2007). "King Arthur in the Lands of the Saracen" (PDF). Nebula. ^ Richard Francis Burton wrote "I should attribute the origins of love to the influences of the Arabs' poetry and chivalry upon European ideas rather than to medieval Christianity." Burton, Richard Francis (2007). Charles Anderson Read (ed.). The Cabinet of Irish Literature, Vol. IV. p. 94. ISBN 1-4067-8001-4. ^ a b c "Knight". The Columbia Encyclopedia, 6th ed. November 15, 2015. ^ a b c Craig Freudenrich, Ph.D. "How Knights Work". How Stuff Works. 22 January 2008. ^ Johnston, Ruth A. All Things Medieval: An Encyclopedia of the Medieval World, Volume 1. Greenwood (August 15, 2011). pp. 690–700. ASIN: B005JIQEL2. ^ Crouch, David (1993). The image of aristocracy in Britain, 1000–1300 (1. publ. ed.). London: Routledge. p. 109. ISBN 978-0-415-01911-8. Retrieved 4 December 2011. ^ Norris, Michael (October 2001). "Feudalism and Knights in Medieval Europe". 'Department of Education, The Metropolitan Museum of Art. ^ Hare (1908), pp. 211–218. ^ Daniel Eisenberg, A Study of "Don Quixote", Newark, Delaware, Juan de la Cuesta,1987, ISBN 0936388315, pp. 41–77, revised Spanish translation in Biblioteca Virtual Cervantes. ^ "The History of Knights". All Things Medieval. ^ "History of Knights". How Stuff Works. ^ "Malta History 1000 AD–present". Carnaval.com. Retrieved 2008-10-12. ^ "Michael De-La-Noy, obituary in". The Independent. London. 2006-10-17. Archived from the original on 2007-11-23. Retrieved 2009-11-19. ^ Burke, Bernard & Ashworth Burke (1914). General and Heraldic Dictionary of the Peerage and Baronetage of the British Empire. London: Burke's Peerage Limited. p. 7. Retrieved 4 December 2011. The hereditary Order of Baronets was erected by patent in England by King James I in 1611, extended to Ireland by the same Monarch in 1619, and first conferred in Scotland by King Charles I in 1625. ^ "No. 27284". The London Gazette (Supplement). 13 February 1901. p. 1139. ^ "No. 52120". The London Gazette. 24 April 1990. p. 8251. ^ "No. 54597". The London Gazette. 3 December 1996. p. 15995. ^ "No. 30250". The London Gazette (Supplement). 24 August 1917. p. 8794. ^ a b c d e "Women Knights". Heraldica.org. Retrieved 2011-08-23. Keen, Maurice. Chivalry. Yale University Press, 2005.